It was raining, cold, damp and miserable, with no let up in sight. I was content to remain indoors enjoying the rain as it pelted away outside; perhaps a bit of puttering, catch up on a stack of reading, take a deep breath and contemplate life. I built my first fire of the season and snuggled in for an easy, relaxed day. By mid afternoon anticipatory thoughts of dinner begin to surface: something warm and satisfying, easy comfort food… a survey of the fridge offers no such solutions. In the freezer, however, I spot a small container of lentil chili, leftover from a previous feast. My thoughts drift to cornmeal… ever since South Carolina I have been a big cornmeal and grits fan. I can’t get enough of it. I love grits for breakfast, polenta in the evening topped with almost anything, I love cornmeal in cakes, biscotti; you name it. Not long ago, a friend shared a delicious handmade tamale purchased at a small downtown Mexican mercado. It reminded me of Costa Rica and the fabulous banana leaf wrapped tamales I enjoyed there for breakfast: a simple vegetable filling encased in creamy masa. Superb. 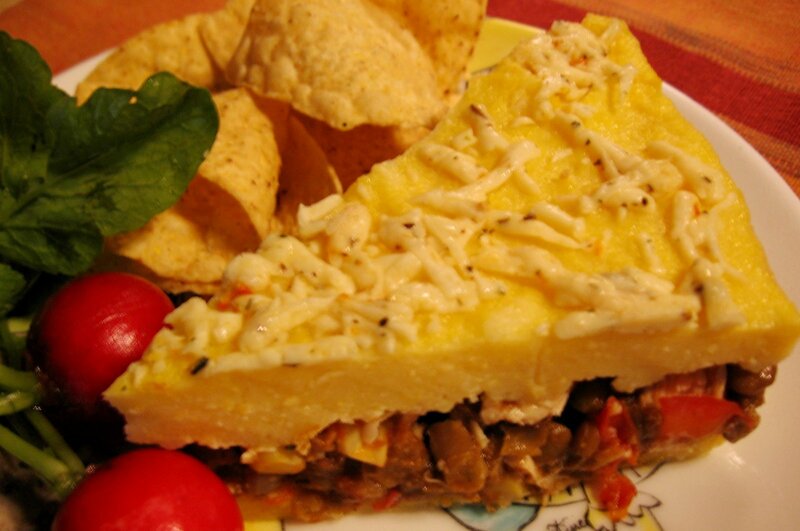 I flash on the tamale pie I labored over years ago for special company. According to others, it was a disaster. Perhaps it was a bit heavy on the cornmeal mush border… but what’s wrong with that? Nevertheless, it has been the brunt of endless family jokes and I haven’t made tamale pie since. Well, why not? A quick search on line and I get a few good ideas and proceed with my simple, satisfying and highly enjoyable Tamale Pie. Note to self: continue saving those yummy lentils! I’ll be making this one again! Since I adore anything with chilies in it, I tend to have a cabbage on hand for such occasions. This version of cabbage salsa, a salad or slaw of sorts, is the perfect accompaniment, and is equally as good with fish tacos to posole. Spray 7×11″ casserole and preheat oven to 350 degrees. Cornmeal Layer: In medium pot, bring 3 1/2 cups water and salt to a boil. Combine remaining 1 cup water and cornmeal together and gradually whisk mixture into boiling water. Reduce to medium low, cover loosely and simmer til thick and very tender, about 14 minutes; stir regularly to keep from sticking on bottom. Remove from heat and stir in yogurt. Place cabbage in large bowl and sprinkle with salt. Let stand about 20 minutes then drain off any liquid. 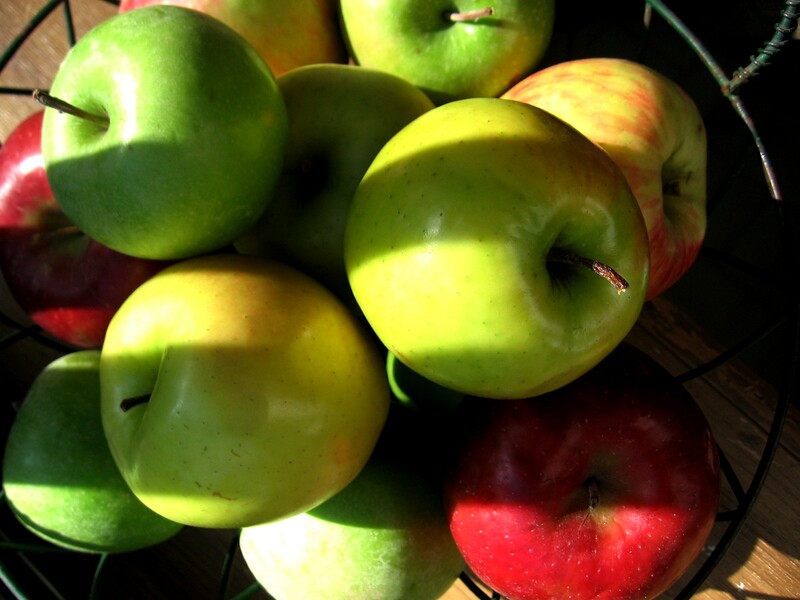 Another pleasant, non-controversial tidbit: October is National Apple Month. How reassuring to know that America’s revered apple is suitably honored with more than a sensational and fleeting 15 minutes of fame! It seems that the ubiquitous apple is always around, so what’s the big deal? Thanks to cold storage technology, come those dreary days of winter, the apple is a frequent and welcome addition in many households. Once October appears again, we are blithely reminded how little comparison there is between a crisp, juicy, sweet apple fresh picked from the tree and last year’s mushy and flavorless counterpart. And so with renewed gladness in our hearts and happiness abounding, it is time to embrace a new crop of apples – and this year they are excellent! But wait, there are so many varieties to select from, deciding on the right apple can be tricky. Fortunately, many markets now provide plenty of product information ranging from the state or country of origin to their flavor profile and suggested usage. Generally speaking, I tend to rely on the eye ball approach: apples for eating have wrinkles on their blossom end while apples that are good for cooking are smooth on the blossom end. Preheat oven to 350 degrees. Line and spray 8×8″ pan. 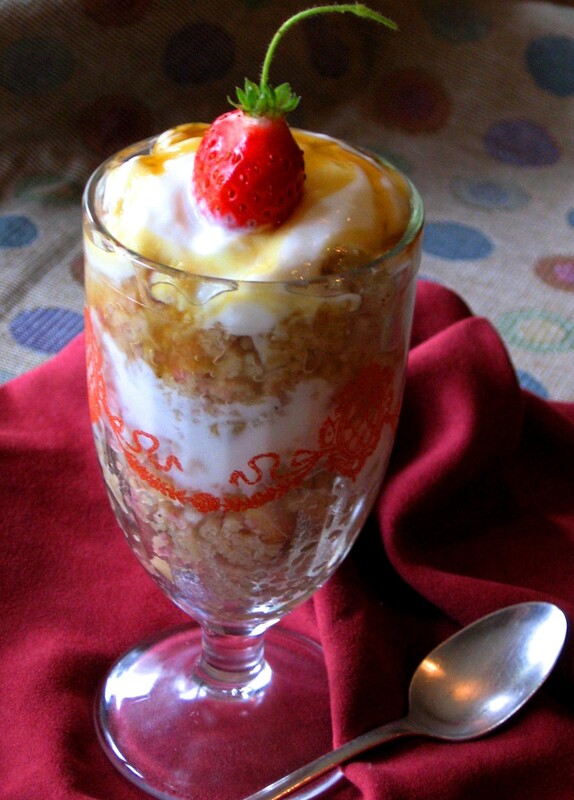 Combine dry ingredients and oatmeal and set aside. Chop the apples and set aside. In mixing bowl, beat the butter, add the eggs one at a time. Add the sugar and beat til cream, about 5 minutes. Add the vanilla. Stir in the dry mixture and mix well. Add the apples and coconut and mix to combine. Spread into prepared baking pan and bake for about 35 minutes, or until bars tests done. Remove to rack and cool thoroughly. Cut and sift with confectioner’s sugar. Serves 9 or more. In a large saucepan, combine all ingredients and bring to a boil, stirring occasionally over moderate heat til thick, about 40 minutes. I love breakfast, or more correctly, I love the idea of breakfast. I visualize myself commencing my day stylishly savoring a favorite selection of morning foods: beautifully presented fresh fruit, wholesome breads enfolded in a lined basket, eggs one of a thousand ways, excellent coffee, all the trimmings. For many years my schedule was so crazy erratic it was far easier to pass on breakfast altogether and deal with it later, perhaps on the weekend. I had the attitude if I couldn’t sit down and calmly enjoy my meal, I’d rather not; a bad habit and counter productive: running on adrenaline and coffee. The breakthrough came when I finally made the correlation between my eating meals regularly and achieving optimum performance. I started recognizing that I didn’t fade unexpectedly, my mind was sharper, and my physical stamina improved. I began making an effort to eat something in the morning, and for a long time Raisin Bran was my uninspired, yet highly satisfying solution. While living in Florida where fresh fruit is abundant year round, I got in the habit of cranking out a smoothie for a morning pick me up. Orange juice was usually part of the equation and whatever fruit happened to drop from the sky. I’d take a break with my smoothie, sit under my queen palm and watch the lizards chase each other. Since I’ve been working from home much more this past year I’ve taken to preparing ahead a pot of a dried grain – such as oatmeal, along with some dried fruit for a quick warm up in the microwave when the urge hits. Recently, I had one of those amazing ah ha! moments when I contemplated couscous as a breakfast option. Why not, indeed! The new crop of apples and pears coming into the markets make this the perfect time to include them as well. Place couscous in bowl, add salted boiling water, cover and let stand while preparing fruit, about 10 minutes. Place all in blender and process for @ 30 seconds. Ever since my stint on the French Riviera a few years back I have been smitten by lavender. The Mediterranean heat and soil create the perfect growing conditions for its cultivation, and I vividly recall romantic fields of lavender artfully brushed about the countryside. The markets were redolent with its fresh green scent, too. I’m still transported by anything even remotely related to lavender, from sachets and dried arrangements to colorful Provencal fabrics. On my return home I tried growing lavender, but sadly South Florida was not the South of France. To my elation I discovered it grows very well here in Oregon and have wasted very little time in planting two varieties: a yellow and a blue-purple. I’m told lavender can be slow to bloom in its first year, so I’ve been happy to fuss over them like a doting parent, just happy they are there: growing chubby and sending up a few colorful blooms. One day this summer on a visit to my local farm stand, I spotted huge bouquets of lavender; apparently a bumper crop shared by a local grower. I was beside myself with excitement: the idea of having such a huge amount at my disposal! I gathered up the biggest bunch possible and buried my nose in the center of this blissful purple haze! Heavenly! My own catnip! Now, really. I needed more information; why was I so undone by lavender? I learned that it has a long association with love and is considered an aphrodisiac. It has great healing qualities and is used in antiseptics. And how about some of the folklore claims: back in the Dark Ages it was considered an embalming aid for corpses; and mystics still recommend it for clearing rooms of evil spirits. Well, there you have it, Nature’s insurance policy. With lavender nearby, all my bases are surely covered! Today lavender is as popular as ever and is practically a household word; it’s ultra-clean scent is in laundry detergents, household cleansers and body products. If that’s not enough, it is used to induce sleep, ease stress and relieve depression. It is also used as a tea, to make compresses for dressing wounds and to apply to the forehead to relieve congestion on sinuses, headaches, hangovers, tiredness, tension and exhaustion. Personally, I can vouch for its calming and uplifting qualities! Suffice to say, it’s been quite the relaxed lavender summer; with all my puttering I managed to whip through my entire supply except for one small dried bouquet. This past week with the change of seasons approaching, it was cooler and time to bake. Again, I had lavender on my mind. 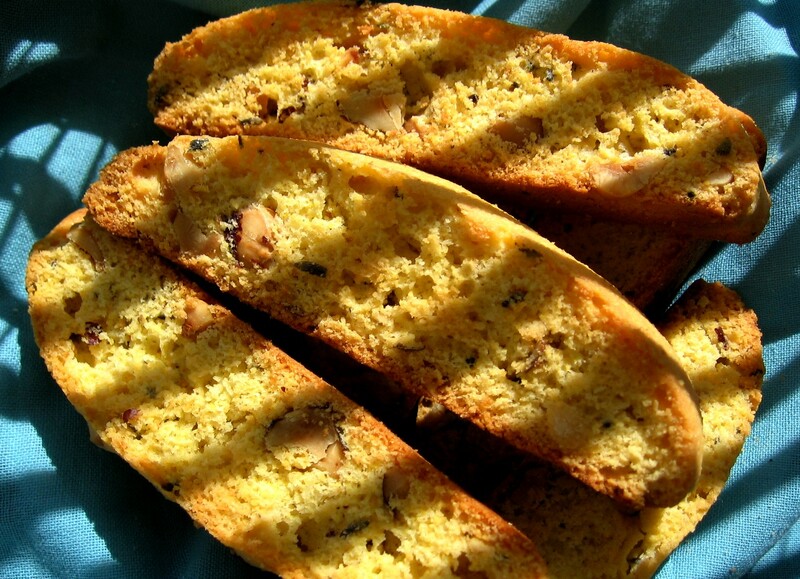 Here is my favorite biscotti recipe which includes cornmeal and usually fennel seeds for flavoring. 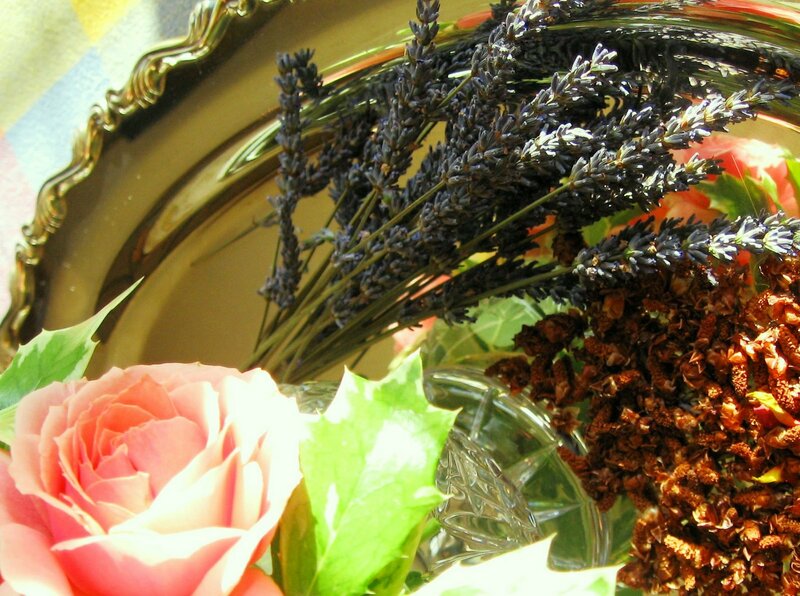 I’ve substituted lavender instead – its delicate perfume provides an exquisite complement. This cookie is especially delicious with Earl Grey tea for dipping. In a mixing bowl, mix sugar, butter, orange juice and vanilla, beat in the eggs. Separately combine dry items and stir into sugar mixture. Stir in lavender and nuts. Cover and chill until firm, 2 to 3 hours. Preheat oven to 375 degrees line a cookie sheet with parchment or silpat. Shape dough on sheets into long flat loaves, about 1 1/2″ wide. Place them 2″ apart, they will spread. Bake until light brown, about 20 minutes. Remove from oven and lower heat to 350 degrees. For this city girl, it’s been quite a year. My move to the country has been more than a major geographic relocation; it has also been a psychological and emotional shift. I am reminded of that each time I walk out my door and clip an herb or pick a berry. 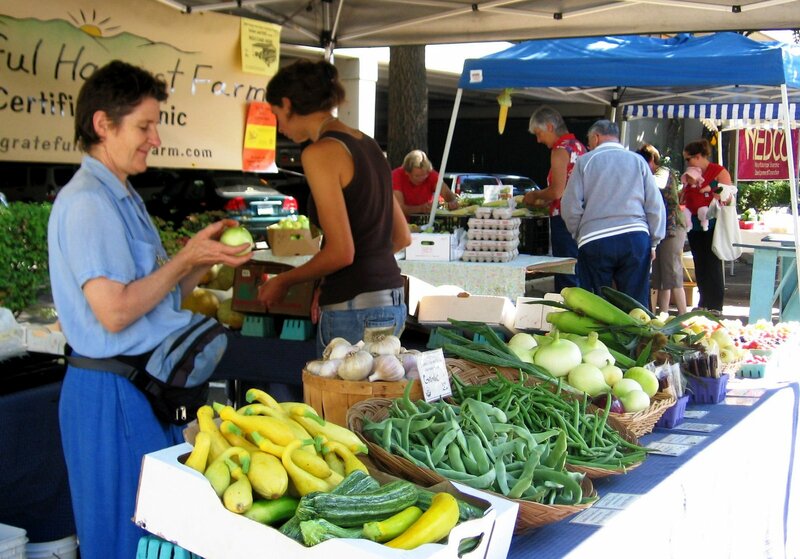 I’ve always appreciated excellent fruits and vegetables and certainly prefer shopping organic when possible. But, in my flawed thinking, produce would always be on my market shelf, I might pay more for it, but that was the height of my inconvenience. I had not made the actual connection between my daily food supply and the earth from which it came. Now, living closer to the land I am fascinated by the order and rhythm of nature; I’m awed by nature’s systematic abundance. How miraculous, the seasonal process of a mere sprout shooting from the earth, manufacturing new branches and leaves, buds and blossoms, and finally bearing its own sweet and succulent fruit, with little assistance on my part! Early in the season, my neighbor next door warned me about our shared blackberry bushes. Apparently, in the past their invasive brambles have gotten wildly out of control, choking everything in their path. I couldn’t bear to completely eliminate them, so I promised to scrupulously monitor their growth and maintain only the tiniest little patch. And so, it has become a ritual and my joy to regularly oversee my little patch of berries, to m arvel at their ability to thrive, to snip when necessary, and to happily harvest a bowl of ripe fruit for later sharing and enjoyment. I have discovered there is nothing better than fresh berries straight up, or perhaps topped with a nice scoop of vanilla ice cream. 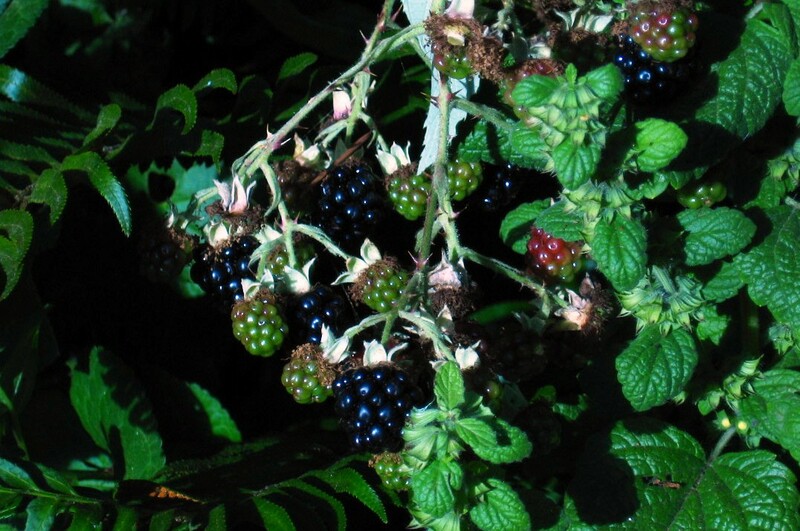 This past weekend on a regular inspection with bowl in hand, I dipped and peered at my thorny bushes looking for more berries. I was perturbed and deeply mystified to admit that my seemingly endless supply was apparently drying up! How could that be? Barely able to glean a full cup of fruit, I sadly noted this year’s best berry days were gone for good. Back in the kitchen, it was only right to pay final homage to my beloved blackberry patch. 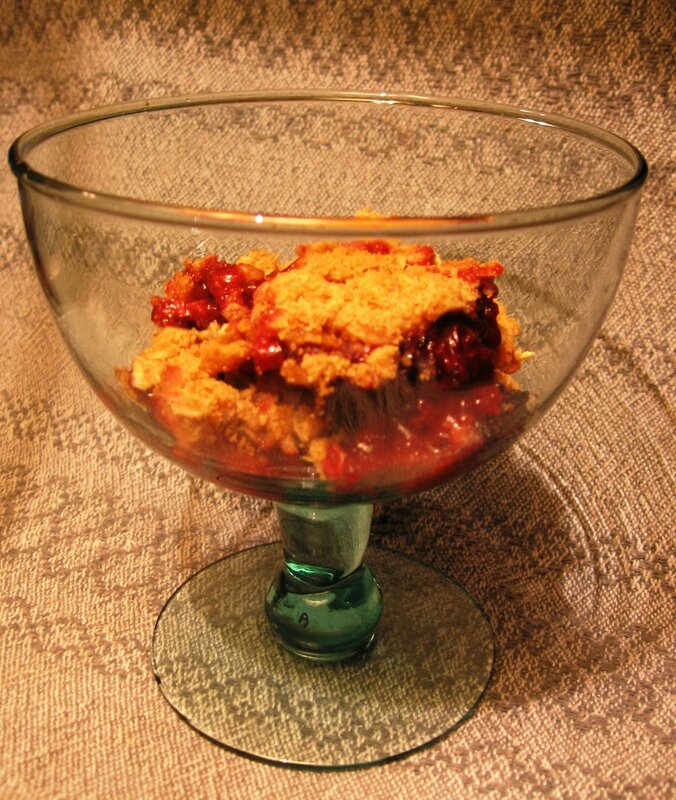 With such a limited offering, I pulled out my most suitable companions, two large tart apples, and set about making a beautiful and appropriate tribute, an old-fashioned Apple Berry Crisp. Preheat oven to 375 degrees. Spray a 9″ oven proof bowl or pie dish. In large bowl, toss apples with lemon juice and orange juice, sprinkle with sugar, cinnamon, and 1 Tbsp of flour. Toss to coat. Place in baking dish and bake about 15 minutes, to pre-cook while preparing topping. In same mixing bowl, mix oats, remaining flour thru spices; work in butter until mixture forms clumps; then add oil and distribute evenly. 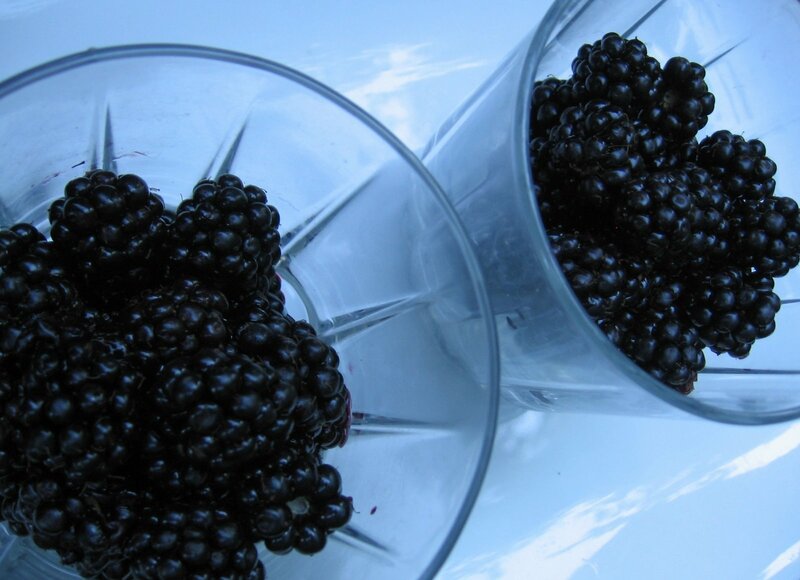 Gently add the blackberries to the partially cooked apples and crumble topping evenly over fruit. The buzz at our Farmers’ Market this past week was all about the baby tomatoes at Quail Ridges’ booth. To prove their point, samples of 5 or 6 different heirloom baby tomatoes were neatly lined up for side-by-side comparisons. Of all, I was most smitten by the baby green tomatoes. Perhaps it was their vibrant green color that threw me off, but I was not prepared for the flavor that burst forth as I popped one in my mouth. This little ball of dead ripe dynamite utterly exploded with sheer tomato essence! Still reeling, I wandered over to Grateful Harvest’s booth and blankly asked Jessie about those funny looking green beans she was fussing over. It always amazes me how patient our vendors are, repeating the same information over and over as if it were the first time. With a sweet smile, Jessie explains that these Italian flat beans may look tough, but they are quite tender and cook in a flash. 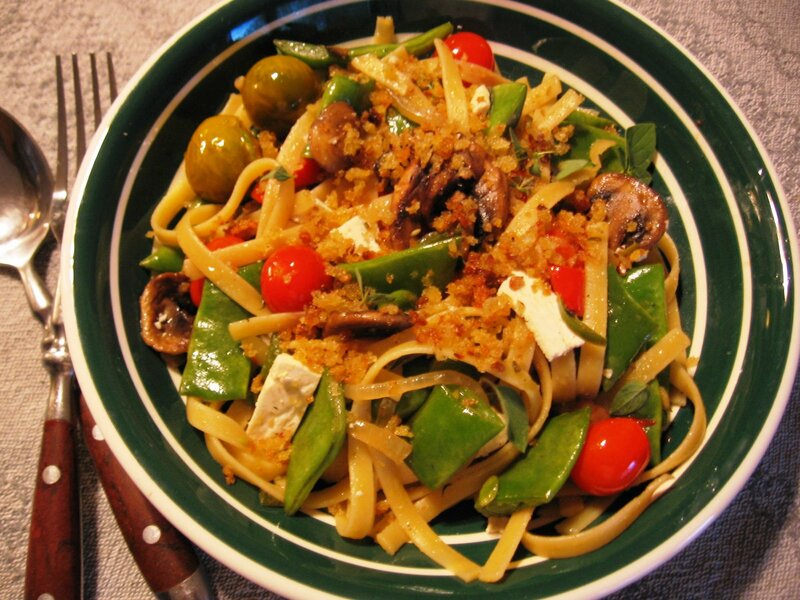 At home much later, it occurs to me that I have all the makings for a delicious fall pasta “primavera”. One quick bite of a Romano bean tells me Jessie was right: these are so tender they will cook in a hurry! Since this will be shades of a stir fry, I begin by bringing the pasta water to a boil. I sauté the veggies and add winter savory, my current favorite herb. It ties the fresh green flavor of the beans and the earthiness of the mushrooms together into a lovely package; the jewel-like baby green tomatoes are left whole for mouth popping entertainment. Yes, the pasta creates the perfect canvas for these beauties to shine and clearly begs for cheese. Ricotta salata, my choice, plays an active role here; if not available, feta would be another good option. Begin by bringing salted pasta water to a boil. When water is boiling, add pasta and cook until al dente, approx. 10 minutes. Drain, reserving @ 1/2 cup of hot pasta water, and rinse. Meanwhile, heat 1 tbsp oil in large sauté pan over medium high heat, add onion and cook briefly til aromatic. Add cut beans and stir fry until just tender, about 5 minutes. Add mushrooms and garlic, then the savory; cook 3-4 minutes til mushrooms begin to release their liquid. Stir in the tomatoes and heat well. 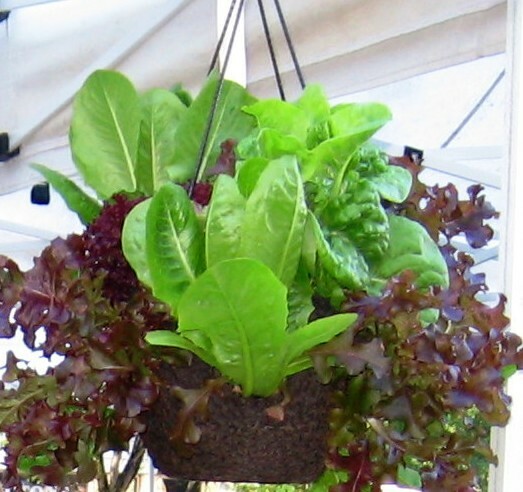 Prowling about our local Farmers’ Market recently, my eyes were suddenly transfixed upon the enchanting baskets freshly displayed at Fern Ridge Nursery’s booth, heads of red and green lettuce formed into lush hanging gardens, utterly dripping in natural abundance. No question, this was a must have: a veritable bowl of instant salad to smartly grace my rear deck, only steps from my kitchen door. 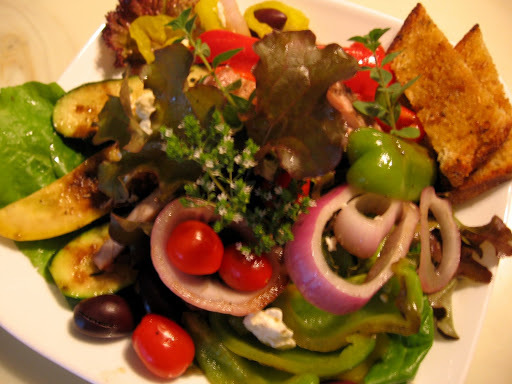 I envisioned self languishing on deck, fabulous lettuce positioned nearby, scissors casually poised, a small stylish dish of flavored olive oil on the ready for dipping. A snip, a dip, a knowing nod, too charming for words! Truth is, my lettuce basket was so beautiful, I could hardly bear to snip its perfect leaves, I could only stare for two days. It took an arm load of zucchini, sweet peppers and red onions to shake my trance and thrust me into action. Fridge staples of Kalamata olives, pepperoncini, and a coveted block of Greek feta made it a no-brainer. It was time to grill! A satisfying summer meal, with enough additional marinade to baste a small amount of fish, chicken, pork or beef . Prepare dressing/marinade, whisking in olive oil to emulsify. Prepare grill and when coals are glowing: brush vegies with marinade and grill to mark on each side, about 4 minutes per side, do not over cook. Grill bread if making bruschetta, brushing with additional dressing if desired.